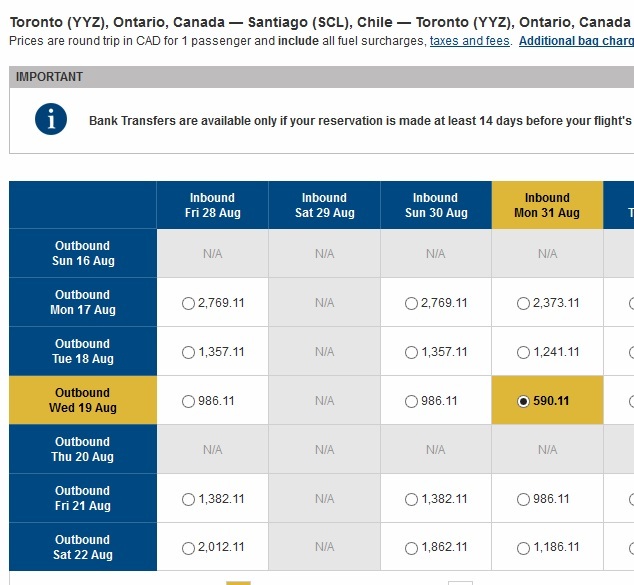 COPA Airlines is showing some pretty ridiculous prices on limited dates from Toronto to Santiago, Chile (SCL) for just $554 roundtrip including taxes. 3. The price will show up as $564 roundtrip, but you can bring it down a little further by entering the following promo code on the Passenger Details page. 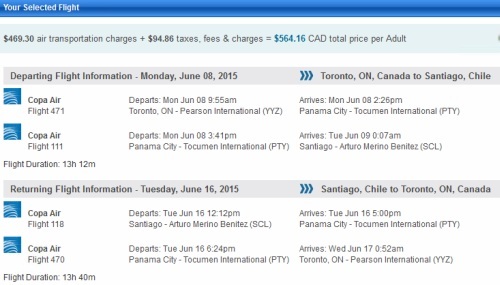 Note: You can also book these flights directly on the Canadian version of the COPA website, but for $590 CAD. Chile used to have a reciprocity fee for visitors from Canada, but that's no longer the case (as of March 2014). It's now free for Canadians to enter Chile. The August flights do not look to be bookable over at FlightNetwork, only directly on the COPA Air site. On the Canadian version of the COPA site, they are coming up as $590 CAD roundtrip including taxes. Update June 4 @ 10:25 AM EST - I'm getting an error on the COPA site now. ^^ only certain combinations are giving that error (eg: Aug 19-31 and Aug 21-31). Aug 21-28 works. Looks like it's the Aug 31 return date that might be sold out. Aug 19-28 might be the longest August trip that still works. 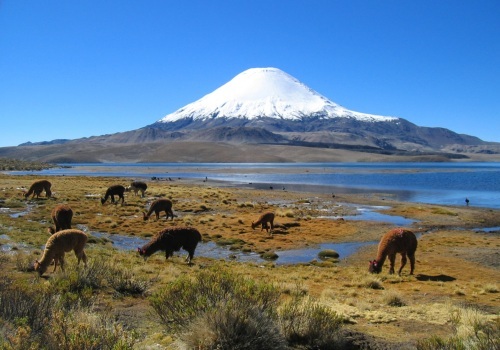 toronto, yyz, flight deals, copa airlines, santiago, chile, scl and south americea.